It’s surprisingly easy to make a pesto. Like, if you got a food processor and 10 minutes you’ll have glorious homemade pesto. Bam! Did I just blow your mind? Mine was when I made this. 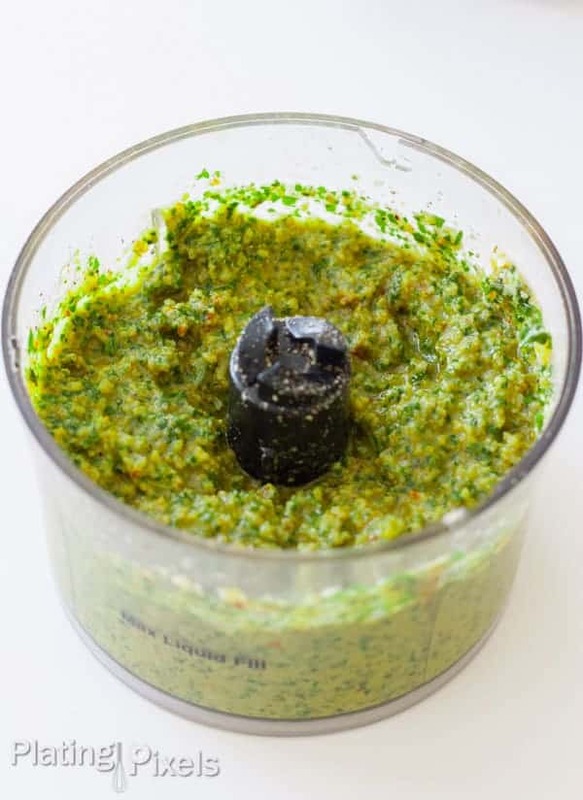 I based this traditional pesto, but modified it into this Toasted Walnut and Sun-Dried Tomato Pesto recipe. No more boring, run-of-the-mill pesto. Now you get roasted, nutty, slightly tangy, and a bit savory pesto. Traditionally pesto is made of pine nuts. These can be pricey, and almost any nut can be substituted for a differently flavored pesto. Toasted walnuts are my preferred alternative. I’ve been apartment hunting all weekend and am so happy I finally found a place closer to my new work. With a busy schedule and not much time, a quick recipe like this is an ideal base for anything. Add it to pasta and chicken, be courageous and serve over baked fish, or make a healthy pesto sandwich. It’s so adaptable I even turned it into and another mind-blowing recipe…when you’re done checking out this recipe, be sure to look at our Avocado Pesto and Chicken Mexican Pizza. Pesto requires a Cuisinart or food processor. You can also use one of those immersion hand blenders with processor attachment, or even a high-speed blender. Toasting nuts is simple. Add them to a small pan over medium heat. Cook, stirring constantly, for about 4–6 minutes, until lightly browned and fragrant. Be careful to not overcook, and be sure to remove them from the pan immediately, as the heat will continue to cook and burn them. 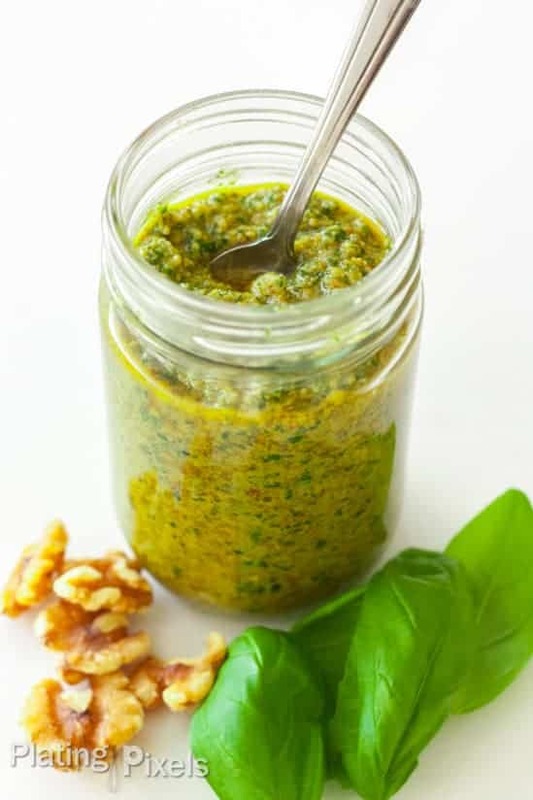 Enjoy a unique way to enjoy homemade pesto anytime with this Toasted Walnut and Sun-Dried Tomato Pesto recipe. The citric acid in lemon juice acts as a natural preservative and anti-oxidant. This critical ingredient adds flavor to the pesto and helps extend the shelf-life. You can store prepared pesto in an airtight container in the refrigerator for 1–2 weeks. 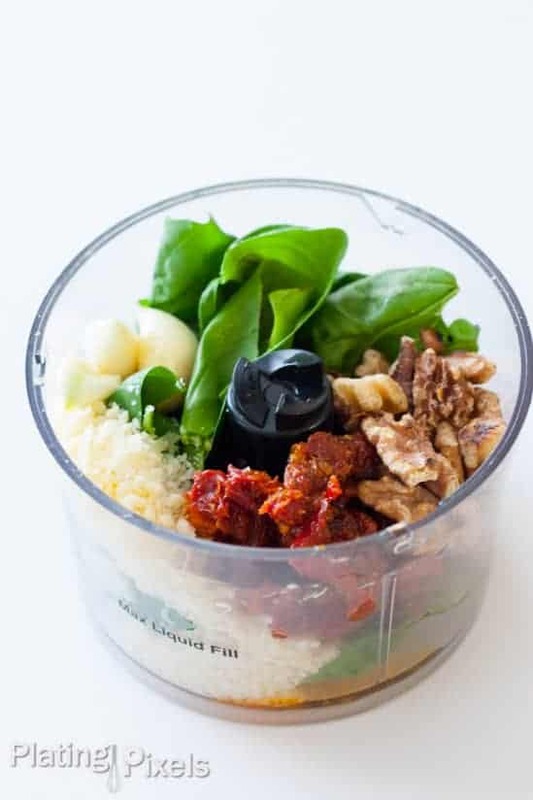 Toasted Walnut and Sun-Dried Tomato Pesto recipe. No more boring, run-of-the-mill pesto. Now you get roasted, nutty, slightly tangy, and a bit savory pesto. 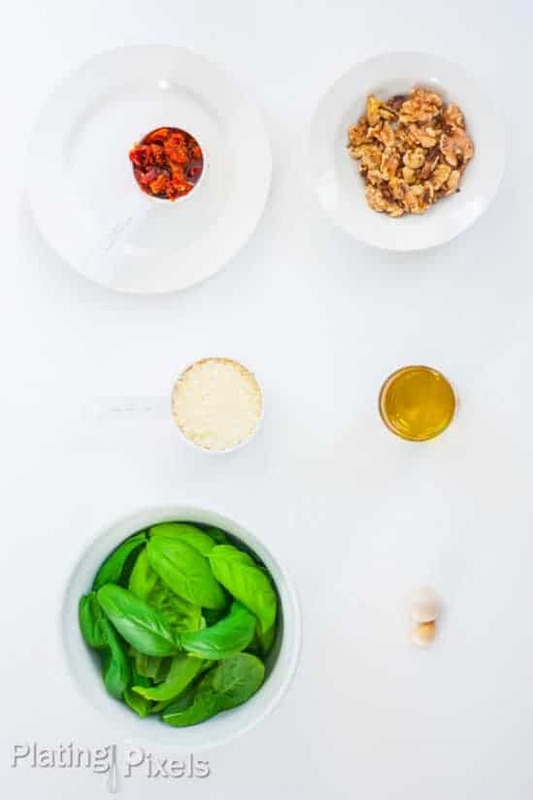 Place basil leaves and olive oil in a food processor. Pulse until blended and completely combined. Basil leaves should be minced and mixture will still be thin. 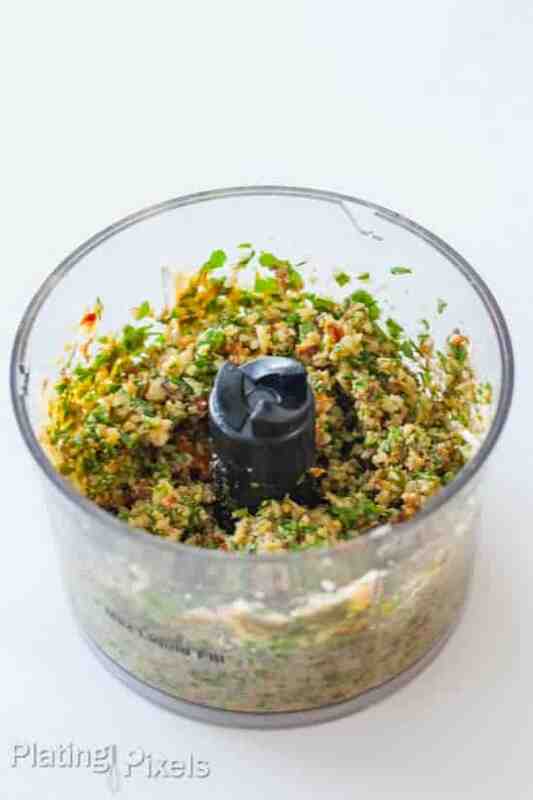 Scrape sides and add all other ingredients to food processor. Continue to pulse until ingredients are completely blended and combined (scraping sides between if necessary). You should end up with a thick pesto-like consistency. If needed: add more basil leaves to thicken or add more olive oil to thin. YUM! ive been looking for ideas to use up last years sundried tomatoes and this looks perfect. I’ve pinned for later. Thanks for sharing! Hi Rachel, you’re welcome. I agree that would be a perfect use for those. It sounds like those are homemade sundried tomatoes? That sounds like a fun idea. This sounds really delicious! I’ve made traditional basil pesto before, and also kale pesto (great way to use up greens you are going to throw out otherwise), but I love the idea of using sun-dried tomatoes. Can you freeze this as well? Hi Laura, the kale pesto sounds like a wonderful idea. Did it still have basil? I’ve frozen other pesto recipes, then thawed them in the fridge before using. They turned out fine and the constancy was the same. Hi Natalie. Thanks for the nice comment. I’m glad you like my drool worth photos 😉 I like the look of your blog and the cute illustrations. I love finding different versions of pesto! I once made a vegan one with spinach and almonds. The sun dried tomato sounds delicious 🙂 Pinned! Hi Kelly! That vegan pesto recipe sounds amazing as well. Thanks for the comment and pinning!